Avanti Bread Slicing Guide ​Slice your loaves of bread evenly, easily and safely with this Avanti Bread Slicing Guide! It has precision guide slots, the bread is held firmly so it does not slip and directs your knife to cut equally at the desired thickness. 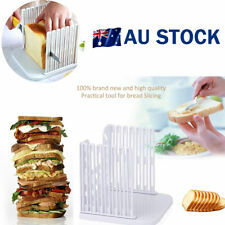 AU Bread Slicer Toast Cutter With Cutting Guide Sandwich Maker Slicing Machine. 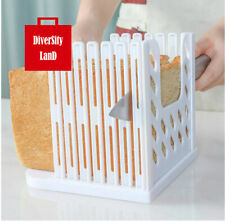 The bread slicer can be folded, it just needs a small space and you can put it anywhere. 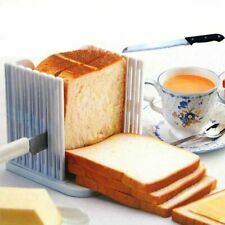 1PC Bread slicer. Simple and easy to use and to keep clean. This item is a bread slicer. Made by premium ABS material, safe and durable for use. It allows toast and bread to be cut evenly and safely. It is suitable for slicing bread, toast, bagel, loaf and sandwich, it can also be used to cut ham, cheese and vegetable. Features: Practical tool for bread slicing. Simply place your loaf inside the guide for perfect, even slices. Easy cleanup. Simply dump the from crumb catcher. Slice all breads safely and easily. Description: Compact, lightweight and portable. Easy to use. Slicer stores neatly and safely in the board. Specifications: Material: ABS material Assembled measures: 5.8" H X 5 1/2" W.
Breville Bread Slicer Guide. Folds Up -Compact - Very Strong Plastic. 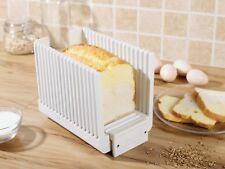 The bread slicer can be folded, it just needs a small space and you can put it anywhere. 1PC Bread slicer. Simple and easy to use and to keep clean. Anyway we will try our best to avoid this kind of thing. Quantity: 1x bread slicer and 1x cake cutter. - Color of bread cutter: White. - Size of bread cutter: 16cm x 15cm x 14.5cm. - Color of cake cutter: Green. - Size of bread cutter: 35.5cm x 4.5cm. - Local pick up is available. Features: Made of high quality material, safe and durable. Designed to fold easily for compact storage. Allow to cut the bread into 4 different thickness-10 mm/20 mm/30 mm/40 mm; Never worry about cutting your fingers. 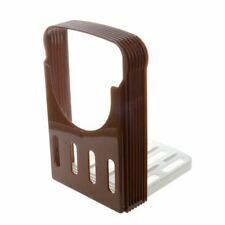 Bread Toast Slicer Cutter Mold Tool. Practical tool for bread Slicing. 1 x Bread Slicer. Simply place your loaf inside the guide for perfect, even slices. Slice all breads safely and easily. Color: White. Bread Slicer Toast Cutter With Cutting Guide Sandwich Maker Slicing Machine. The bread slicer can be folded, it just needs a small space and you can put it anywhere. 1PC Bread slicer. Simple and easy to use and to keep clean. Features: The toast bread cutter can easily cut the toast bread into a neat and uniform thickness. The bread is cut into a uniform thickness of 10mm and 25mm without adjusting the distance of the baffle directly following the baffle. 1 x Bread Slicer. Our goal is. We will be responsible for. Color: White. Practical tool for bread Slicing. Simply place your loaf inside the guide for perfect, even slices. 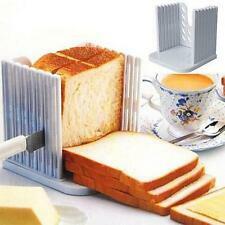 Bread Toast Slicer Cutter Mold Tool. Slice all breads safely and easily. 1 x Bread Slicer. Instructions: Pick up the cake server from the narrow end and select a portion by pressing the other end down through the cake. Grip gently ,and your slice will be held securely in the cake server. Lift on to your plate and relax your grip to release. It is suitable for slicing bread, toast, bagel, loaf and sandwich, it can also be used to cut ham, cheese and vegetable. Bread loaf toast slicing guide. 1 x Bread Slicer. Foldable, easy-storage and space-saving. Bread slicer is a loaf slicing mold and a kitchen professional tool. 1 x Bread Slicer. Item Type: Baking & Pastry Tools. Simply place your bread inside the guide board and slice, keeping your fingers away from the blade. 2 pcsx Cake Slicers. Usage: grip both sides of the saw blade, the cake, the bread can be cut to a uniform thickness. You can follow below process to chontact us. All pictures are for illustration purpose only and Colours may vary slightly. Kitchen Pro Tool Bread Loaf Toast Slicer Cutter Mold Maker Slicing Cutting Guide. MPN Does not apply. UPC Does not apply. Baking & Pastry Tools Type: Cake separator. Type: Baking & Pastry Tools. Dough Pizza Cutter Pastry Slicer Blade Cake Bread Pasty Scraper Blade Cutters. 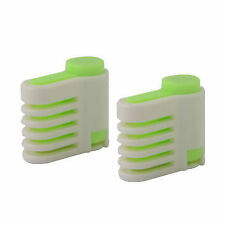 5PCS Toothbrush Head Cover Case Storage Travel Hiking Brush Cap Clean Box Holder. Car Gear Shifter Shift Knob Gear Gaiter Boot Cover For BMW E46 3 Series E36 M3. Color: Coffee, White. Material: ABS plastic 4 different adjustable thicknesses. Easy to clean and fold for storage. Good for slicing cheese and ham, too. Manual allows you to slice and toast bread to be cut evenly and safely. Package including: 1 * bread slicer Note: Light shooting and different displays may cause the color of the item in the picture a little different from the real thing. The measurement allowed error is /- 1-3cm. 100pcs Makeup Cotton Swab Double Head Cotton Buds Wood Sticks Ears Cleaning Tool. Aluminium Alloy Cookie/Biscuit/Cake/Jelly Cutter Tin Mold Mould Baking Tool. Bathroom Drain Hair Catcher Bath Stopper Plug Sink Strainer Filter Shower Covers. 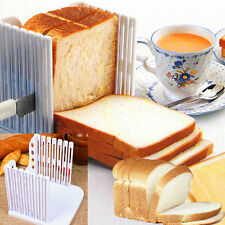 Bread Slicer Kitchen Pro Tool Cut Bread Loaf Toast Mold. Practical tool for bread Slicing. Maximum width of bread 5.25" Bottom of slicer is beige and sides are white. Motorcycle Bicycle Cycling Anti-Pollution Ski Half Face Dust Mask Filter. Dough Pizza Cutter Pastry Slicer Blade Cake Bread Pasty Scraper Blade Cutters. Night Mouth Guard for Teeth Clenching Grinding Dental Bite Sleep Aid Silicone. 5PCS Toothbrush Head Cover Case Storage Travel Hiking Brush Cap Clean Box Holder. Included: 1 X Bread Slicer. Due to the different monitor and light effect, the actual color of the item might be slightly different from the color showed on the pictures. If item is defective after 3 months, you can still send it back to us. Product Type: Bread Slicer. Take out the sliced bread from the upper of the slicer. If item is defective after 3 months, you can still send it back to us. We will send you a new one after receiving the defective item. Manual allows you to slice and toast bread to be cut evenly and safely. 5X(Color: Coffee, White. Easy to clean and fold for storage. ). Manual allows you to slice and toast bread to be cut evenly and safely. 10X(Color: Coffee, White. Easy to clean and fold for storage. ). 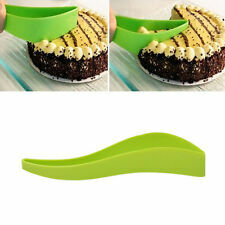 Description: Embedded metalspring, press button type, easy to slice cakes. Cut the thickness of cake be evenly, thinly and easily. Bakeware Toast Slicing Guide Applied: Bread; Cake; Loaf. Bread Knife Splitter Category: Baking tools;Pastry Tools;Kitchen tools. 1 Setx Pastry Tools. Material: Plastic. Import Duties. NEW Avanti Bread Slicing Guide Best Price!